The Cayman Loveseat (281050) is from Lloyd Flanders woven vinyl series of furniture and features a Caribbean inspired light brown Hyacinth twisted wicker weave pattern and can be ordered in your choice of outdoor fabrics for the cushions. Available with your choice of outdoor fabrics for the cushions. Wicker is infused with UV Inhibitors to prevent excessive fading. 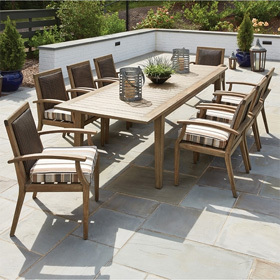 100% Virgin Vinyl wicker has no "filler's" and will remain soft, pliable, and hold it shape. Frames are made from durable aluminum, making it a great choice for saltwater climates.